The week has come to an end. The campers and counselors say their finals goodbyes. Friends and family come to pick them up to enjoy one last moment together at the closing ceremony. We have had a wonderful week with your campers. 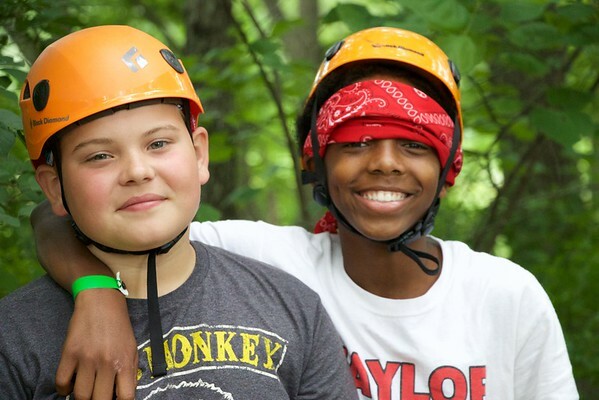 I hope that they share the many memories that they made here at Camp Adventure. God Bless you all. We hope to see you next year! Even though it's the last day at camp, that doesn't mean that the camp memories and adventures will end. 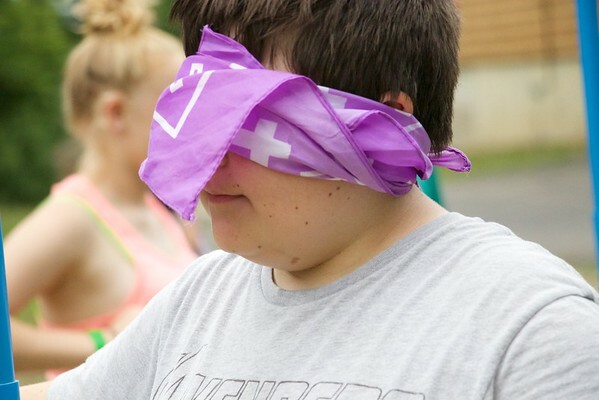 The campers discussed the three steps and identified ways to overcome the fear or struggle that is associated with each step so the campers can feel equipped and able to do all three steps of a witness when they return home. Care: We need to care enough for others to want to witness to them. 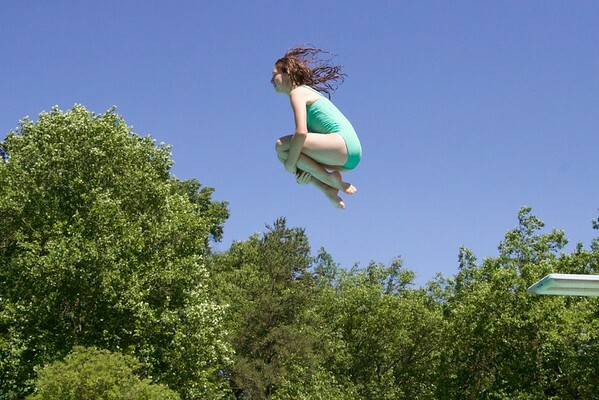 Dare: We need to be daring and courageous to go and witness to them. Share: We need to tell others out witness about what God did for me. 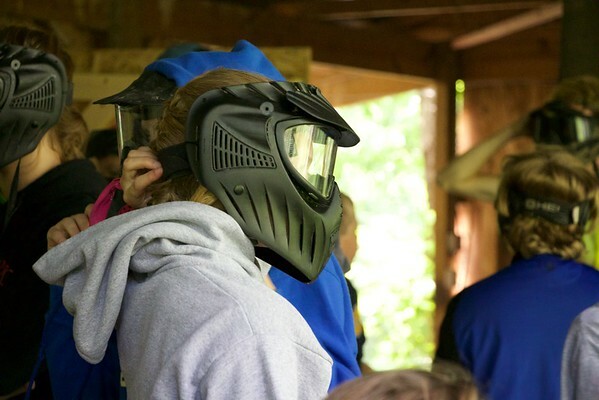 After worship the campers get to use up the rest of their energy to play a game all around the camp. They had to go find five different colors of go sticks and take them back to the rock wall. But here's the catch: there would be staff members patrolling the areas and if the cabins got caught they could get their go sticks taken away. Congrats to Marsh Marigold for winning! "What did you learn about at camp?" I learned who I am in Christ! A little Review: I'm Gods masterpiece! He didn't make a mistake when he made me! I'm a sinner, even my best falls short if it's up to me. When you're lost, the best way to get found is to stop going the direction you're going, turn around and start going the other way! What's a disciple? ; look what Jesus did and do it. Jesus wants us to be a servant! Matthew 25:31- separating the sheep from the goats. I will take the sheep. This is what you did for those in need. This is what you did for me. -what!? When did we ever see you in need or hungry?? Whenever you cared for them, you were doing that for me. You're not a consumer, just needing to be entertained. Church isn't a store. Go from wearing a bib to wearing an apron. Be a disciple, wear an apron. When you meet someone and you find out they don't know Jesus, does it make your stomach hurt. Tonight we saw many talents expressed at camp. Here's one lucky cabin that did an awesome dance. You may have only heard of the table foosball but at CA we like to shake things up a bit. This is the designated rest time of the day/ All of the campers get to rest up before they go out to there activity rotations. After a long night, the campers rush to breakfast so they can get going on this beautiful Thursday morning. "What does the Holy Spirit look like?" "How do you know the Holy Spirit is in you?" Answer- a feeling that changes you. If love and kindness flows out of you then you have the Holy Spirit. "How is the devil evil if God created him?" Rob's Dad spanked him with a belt. Rob took off his belt when his Dad went to spank him to rebel against him from getting spanked. Rob's friend sped and broke the law because he was being rebellious. The Bible is our key to knowing and following God. To be a disciple we must follow him. Reading the bible is obtainable if you break it into parts. Girl has a dream to have a horse and for it to grow up and for her to become a champion horse trainer. The horse became a state champion. Due to the weather changing up the daily schedule, the campers are in the valley playing dodge ball, gaga ball, human foosball, basketball, and all other free time activities. 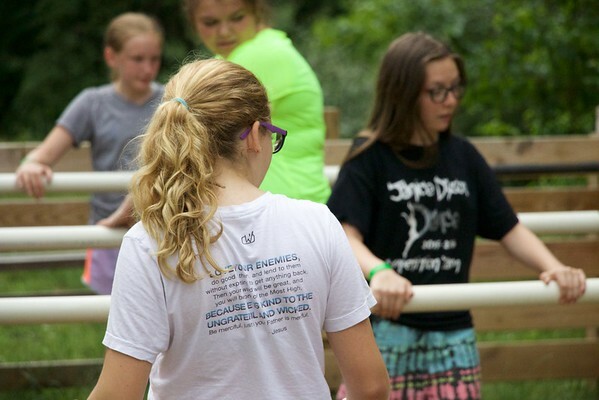 The campers go off with their cabin groups to do their daily devotionals. During this time they go in depth about what they learned the previous day and during the morning worship. After commitment night, the campers learn about the God that they trust with their lives. Through their devotionals they are learning about who Jesus is and was. The schedules have been changed due to upcoming weather. Everyone got in their daily activities and will soon be heading to indoor chapel. 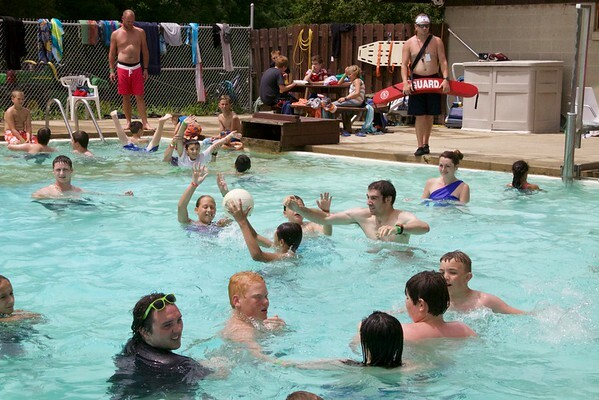 The campers are having a blast with the large activity group and are excited for the rest of the day! 1)"Lift Your Head Weary Sinner"
This week is starting great! Rob's story about 4th grade being saved. In 6th grade his dad's preaching changed from "being nice and good people" to "preaching with power and authority. He prayed healing over a church lady that had a ruptured appendix. Then he gets fired, because haters were drinking haterade. How do you find peace in your storm? Last night we wrote our pain and troubles and God erased it and wrote FORGIVEN (FOGIVEN). We enable to leave out boring hum-drum life and follow Jesus. After that the Holy Spirit will start prompting you to pray for others and such. 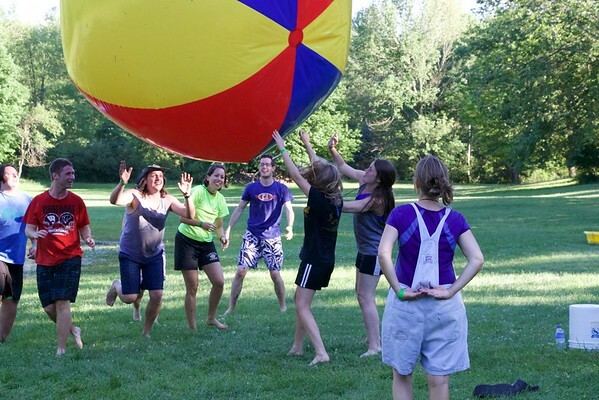 Only at CA will kick ball be played with a ginormous beach ball! 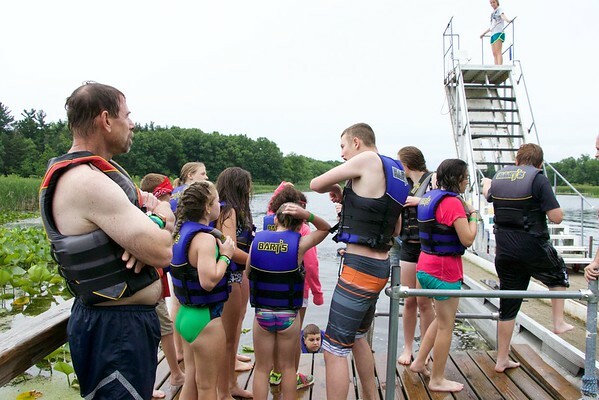 The campers learned how to trust their equipment and face their fear of heights. 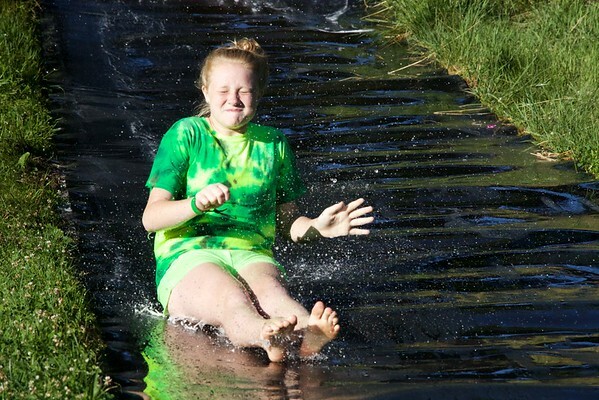 The weather never stops camp from continuing the fun! 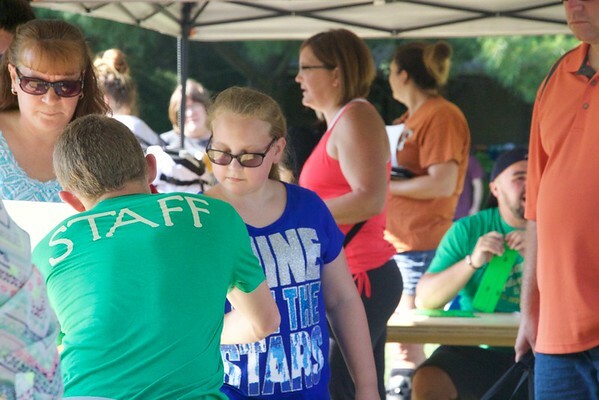 The staff gets ready to hit the stage to test the campers bible skills. We are not living in the truth and worshipping our Lord if we are living in the darkness. The campers went into the back of the worship space (which was dark) and wrote a sin that they wanted to be removed from their life through repentance. After writing this sin down, they turned from this sin and walked into the front of the worship space (which is lit up). This symbolized how we walk away from our sins to walk to God. 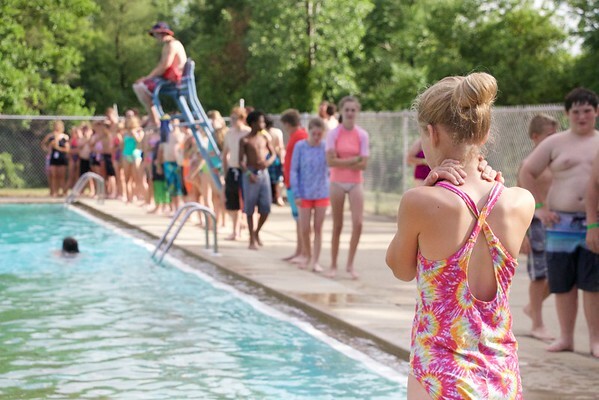 The campers all gather around the poolside as they wait their turn to see if they will be able to go off of the pool diving boards in the deep-end. 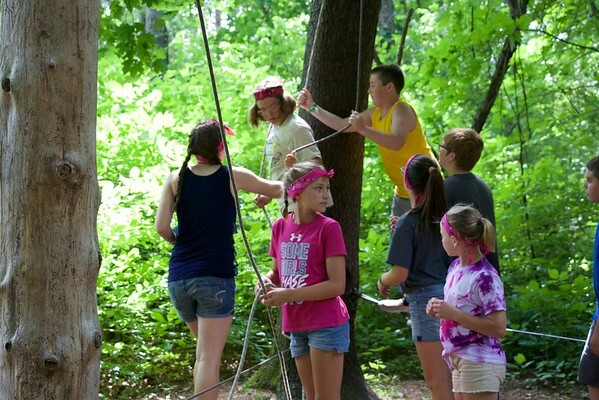 The campers have to learn to trust and work together with their cabins. While the counselors take a break, the two directors take on the job of entertaining the campers with a little fun with trivia. Time to mark each other with pink paint! After a hearty breakfast the campers come together to start their morning off with a few songs. They are also challenged to reflect on the spiritual focus for the day (Sin). 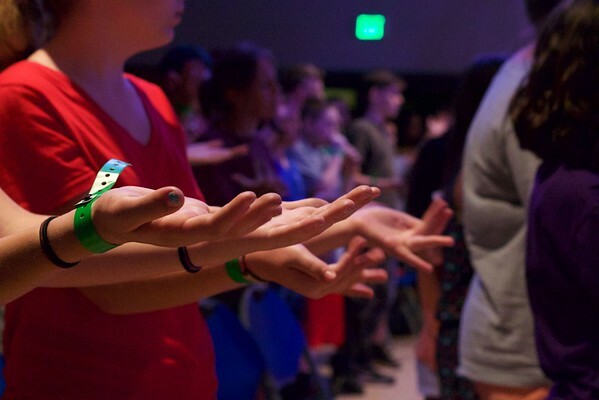 (Jesus and me time) This is the time of day where the campers get to sit back and enjoy Gods presence on their own. They get to listen and hear what the Lord has to say for their lives. None of the campers leave chapel without their evening snack to lull their hungry stomachs to sleep. 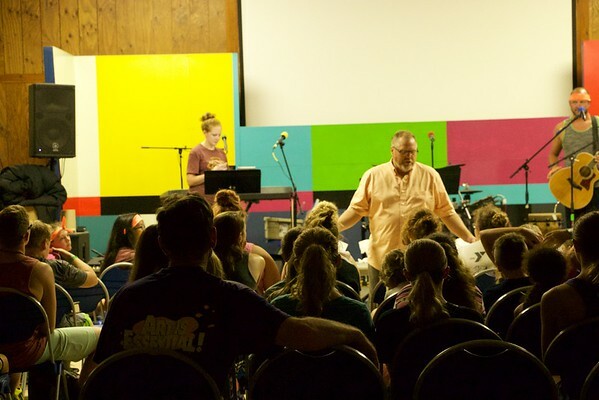 The first night of worship is always a special treat for the campers to get to know the God whom will be working with them throughout the week. You see we're all gods masterpieces because we were created by a mastermind. He made us unique and perfect yet we live in a broken place that see's us as imperfect and worthless but that's not what god has called us to be. This world wants us to wear a mask to fit in and not show our true character. Yet the grace that God has for us is unexplainable that no matter what we do, God still loves you and wants us to live out the person he made us to glorify His Kingdom. We see ourselves as what we own, drive, eat, etc yet we need to see ourselves as God see's us and not focus so much on the outer parts of us but our heart. God created all of us in his image, blessed to be perfect masterpieces. Using various mirrors- when you look in the mirror and write on the mirror of what you think God thinks of you while band played in the back. The campers have just arrived and have energy to be used so, they are playing an awesome game down in the valley to start their week of right! You've just dropped your kids off at Camp Adventure! We're so excited to be able to speak the word of Christ into your children. This week is going to be a week full of life long memories and friends.